Biscotti, those crunchy twice-baked Italian cookies, are one of my favorite things to keep around in a cookie jar to munch on. I love the crunchy texture and given they're usually studded with nuts - and I love most kinds of nuts - I think they make a tasty treat to go along with a cup of coffee or tea in the afternoon or after dinner. Since they hold well for a long time (they're dry to begin with), biscotti are a great make ahead. The fellas don't love them as much as I do so I don't make them that often. That said, I've made a few varieties - from pistachio to hazelnut and chocolate - and I'd say the pistachio and almond ones are my favorite versions to fall back on. But there's one thing I haven't tried...and that's making biscotti that contain butter. Until now, I've follow recipes that make biscotti without butter (I believe that is the traditional way), and I really like it. If I'm to be totally honest, I admit it makes me feel a little virtuous eating a cookie that contains no butter or oil but I also genuinely love the hard crunch of a classic biscotti made without butter. That's not the case for everyone. My husband, for one, is a little fearful of losing a tooth on one of my biscotti. It's funny but I see how some may want just a little yield in their crunchy biscotti. So this recipe deploys a little bit of butter - 4 tablespoons for my batch that will turn out approximately 20 biscotti. It's very reasonable, and you know what? I really liked it! The biscotti is still dry and crunchy but the butter makes for a milder crunch. The biscotti breaks away easily beneath your teeth and well, they're just easy to eat. Because they're not quite so hard, it doesn't necessarily call out for a cup of coffee to go with it but it sure is nice side-by-side. Now that I've tried it, I can say I like my biscotti made both with and without butter. I'll be happy to rotate between the two varieties! This lemon-almond biscotti recipe comes from Laura in the Kitchen, a book I'm cooking out of right now. Laura Vitale has a show in the Cooking Channel and it's been one of my recent favorites; her Italian food makes my mouth water! I scaled down the recipe (you know how I do!) and while biscotti hold well (even the kind with butter), my half-recipe will turn out nearly 20 biscotti. I like to rub citrus zest right into the sugar to get as much flavor out of it as possible. I added a little bit of almond extract, along with vanilla, even though the recipe didn't call for it. When I see almonds, I automatically think almond extract! After the toasted almonds get tossed into the mix, you end up with a sticky dough that's ready to be shaped into logs. My scaled down recipe can be shaped into two logs (original recipes makes 3) and conveniently baked on a single baking sheet. One thing I do always do when it's time to shape the dough into logs is to divide it with my spatula and plop it straight onto a silicon-lined baking sheet. Most recipes will tell you to set the dough on top of a floured surface to shape but for the life of me, I cannot manage to then remove the logs from the surface onto the baking sheet without making a big mess! So I set the dough into something of a log shape on to the baking sheet, spaced about 3-4 inches apart and then shape/smooth out the dough into about 8-inch long logs with my wet hands. This way, you don't have to move the logs again and I find that wetting my fingers with some water works really well for smoothing out the dough. Bake the logs for about half an hour. Then if you know the drill with biscotti, you know it's twice-baked so after letting the logs cool a bit, slice them slightly on the diagonal and place the cookies back into the oven. Bake for 7 minutes, flip the cookies over, and then bake for another 7 minutes. Finally, you are rewarded with your batch of lemon-almond biscotti. They're crunchy, toasty, nutty, with a nice hint of lemon. Enjoy them with a cup of coffee at your earliest convenience! Preheat oven to 350 degrees. Line a baking sheet with a silicon baking mat or parchment paper. Place butter and sugar into the bowl of a stand mixer fitted with a paddle attachment. Zest the lemon directly into the bowl. Using your fingertips, gently rub the lemon zest into the sugar a bit until moistened. Beat the mixture until light and fluffy, about 2 minutes. Add eggs, vanilla and almond extracts, and mix to combine. On low speed, add flour mixture, mixing until just incorporated. Fold in the toasted almonds using a sturdy rubber spatula. Divide the dough in half using your spatula. Drop each half on to the prepared baking sheet, spaced 3-4 inches apart to allow for spreading. Moisten your fingers with some water and use your wet hands to shape each piece into about an 8-inch long log. Gently flatten the logs with your hands until they are about 2 inches wide. Bake until logs are light golden brown and firm to the touch near the center, about 30-35 minutes. Leave oven on but remove the baking sheet from the oven and let cool for about 10 minutes. Then, transfer the logs to a cutting board. Using a serrated knife, cut at an angle into about 3/4-inch thick slices. Arrange biscotti with a cut side up on the lined baking sheet. Bake for 7 minutes. Flip the biscotti, rotate baking sheet front to back, and bake for another 7 minutes longer, or until they are golden all over. Let cool for about 5 minutes on the sheet, then transfer biscotti to a wire rack to cool completely. The biscotti can be stored in an airtight container for a week or so. They are definitely my favourite too. Save me a few slices :-)) while I go brew some tea, please. I learned it and never looked back. Great to have and keep around. Happy Mother's Day to you Monica! I love biscotti and haven't made it in years. This version looks wonderful. I could be very happy with a cup of tea and a crispy crunchy satisfying cookie with just a touch of butter :) Yum! I'm sure you have lots of exciting things happening on Sunday. Enjoy it! I'm with you - I just love having biscotti in the house to snack on with my afternoon cup of tea!! There's something about them! And with lemon and almond? I would certainly not be able to resist these!! Why doesn't it surprise me that your lovely biscotti would be full of almond flavor?! (I bet hazelnut would work well too!) :) You have mentioned your love of the "break-a-tooth" crunch variety, but I am glad you gave the butter version a try and liked it. I am with you, Monica, on the shaping of the logs right on the baking sheet. I can't imagine trying to move the logs intact from a counter onto the baking sheet! For the second baking, I always stand my biscotti up, bake for longer, and don't have to flip. Do you think the turning-over method in this recipe makes for a crispier biscotti? Have a lovely Mother's Day! Yes, I'm so predictable that way! : ) I really liked the texture of this dry yet not super hard biscotti so I'm very happy to have tried it. I like your technique of just baking the sliced biscotti up! I like messing with my food/cooking so I don't mind the flip but I love your shortcut. I think if you want a crisper cookie, probably more likely better to bake it a bit longer - and vice versa? Who doesn't love almond biscotti. And lemon + almond sounds like a great pairing, Monica. They would be prefect with a hot cup of coffee! Love that you rub the citrus zest into the sugar. Thanks - looking forward to the weekend. It's be wet and rainy here...hope the sun comes out! Would love to be dipping one or maybe two of your gorgeous lemon and almond biscotti's into my coffee this morning. I love that crunch! This looks intriguing and quite tasty! Hello dear - wow, I've never managed to make those biscuits; -((( shame on me...I love them so much! Yours is a success - they look very appetizing. Have a lovely weekend! ;-) Today I have a day off, yuppie, yuppie!! Enjoy your day off, and the weekend! I was very happy when I first learned to make biscotti since I used to buy them often. It's great to realize things aren't all that hard to make for yourself. 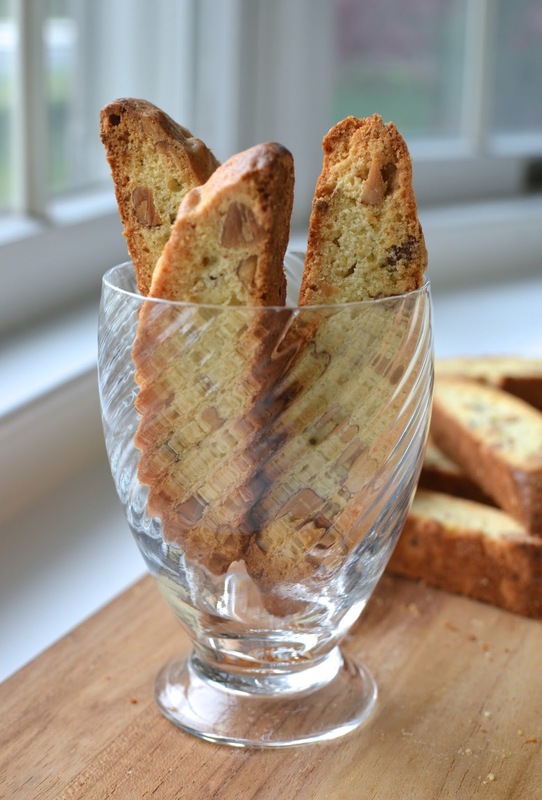 What a perfect recipe for biscotti, Monica! We usually make them every Christmas to dunk in wine or coffee! A classic Italian cookie! Happy Mother's Day weekend! Appreciate that! We have the Italians to thank for sooo much goodness! These look amazing and what a nice combination of flavours. My cookie jar needs to be stocked with these cookies as soon as possible! Love them. I absolutely love biscotti and this is no exception. The art of biscotti is so fun right?! I love the added lemon in it. I've never had a lemon infused biscotti. They look perfect Monica. In fact when I was typing to visit your page, something told me it was some hard cookie and bam, it's a biscotti, I kid you not. When my dad visited us and the first time he had a biscotti, he told the exact same thing, I don't want to break my teeth, haha. That is too funny! : ) I hope you had a great Mother's Day. We had a great day and the sun is shining again after a week of rain. I'm happy with that! These look amazing! I've been a fan of Laura's videos on You Tube even before I started the blog. Your post reminds me that I have not made a biscotti in years. I'll start over with this one. Lemon and almond...so delicious! I love her show...a second season just ran and I am hoping for more soon. They look absolutely amazing!!! :) Yum yum! :) Agness of Runagnessrun. Look very crispy and delicious. Will very good to eat while drink a cup of copy. Waiting for next post, my friend! Hi Monica, I bet these are delicious, I have never made biscotti with butter before but the texture sounds perfect. Love the flavor combo you created.